Although mostly known for his time spent drumming in acts like The Travel Guide, Spirit of the Stairs, and Jenny Wood, guitarist/songwriter William Erickson is the guiding force behind Team Tremolo. 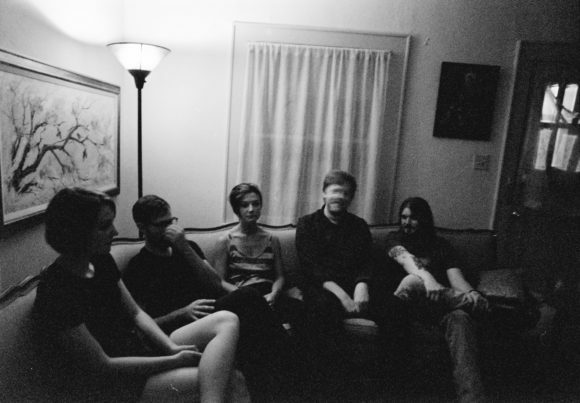 Taking their name from a Too Femme song of the same name, the band began as a bedroom demo project in 2013, but by 2015 had turned into a full band. Joining Erickson are his bandmates from The Travel Guide—guitarist Kristyn Chapman, guitarist Thayne Coleman, and bassist Caleb Drummond—as well as singer-songwriter Jenny Wood. The cohesion evident in Team Tremolo’s first recording may stem from the interconnecting musical lives all the players have shared throughout these different groups, but despite those intersections, Team Tremolo maintains a distinctive musical identity. Calling to mind 90’s acts like Swervedriver and Failure, Team Tremolo successfully combines heavy, pulverizing guitars with ghostlike, fragile vocals, melding it all into it’s own encompassing universe.